What's Causing My Body Odor? 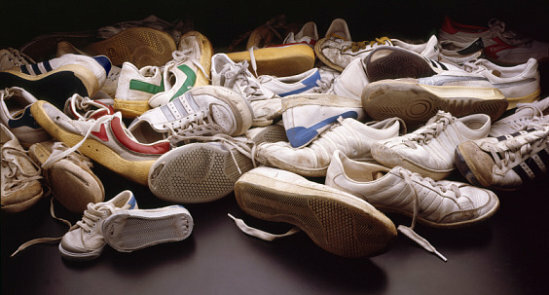 5 Surprising Causes | SteriShoe Blog | Are Smelly Feet Genetic? 1. Your Stress Hormones Are In Overdrive. Your car broke down. Your significant other left you. You lost your wallet. And your boss is unhappy with you at work. Sometimes it seems like you can never catch a break! On top of all that, you’re painfully aware that the odor emanating from your body is not normal. Did you know that there are different types of sweat? Chemically speaking, the stinkiest of all sweat comes from the apocrine glands located in the armpit and genital regions. Unlike workout sweat comprised of water and electrolytes, the apocrine glands produce a fatty sweat that bacteria just loves to gobble up. It’s actually the bacteria’s excretion process that reeks to high heaven. 2. You’re One Of The Elite Few Cursed By Genetics. According to The Huffington Post, about 10-15% of the population have naturally “extra-sweaty feet by the luck of the genetic draw.” Since the average human foot has about 250,000 sweat glands, your footwear tends to get saturated with moisture — especially if you just so happen to produce more sweat than everyone else. Commonly, a bacteria called Micrococcus sedentarius makes your shoes its happy home, where it produces an awful sulfur smell. 3. Your Diet Consists Of Smelly Foods. It’s not just an old wives’ tale that stinky foods cause body odor. When you eat things like garlic, onions, broccoli, and Brussels sprouts, the food gets broken down into malodorous compounds that circulate in the blood stream and seep out through your sweat, urine and breath, reports WebMD. Also, eating a low-carb diet that is heavy in meat can also cause a person’s body odor to change to a fishy smell. If you’ve been focused on losing weight, your body may produce a stench like nail polish remover or a strange fruity ester as your body breaks down fat. Body odor comes in many different scents. 4. You Have A Rare Genetic Disorder Called Trimethylaminuria. A genetic mutation that causes body odor has been discovered. When a person has Trimethylaminuria, the body cannot break down trimethylamine found in choline-rich foods like eggs, fatty meats, almonds, quinoa, broccoli, eggs, cod, and other common foods. The body releases a pungent fishy smell, which can be disruptive to daily life. Shoes hold a lot of sweat and bacteria hostage, and could be causing quite a stink. 5. Your Shoes Are Filthy. Bacterial buildup in shoes is a major cause of day-to-day funk. We don’t think twice about running a load of laundry, but rarely does our footwear get the same sort of attention. The shoe traps sweat and bacteria, so you’re really getting a double whammy! Most people don’t alternate their footwear either, so the shoe never really has time to dry. The best you can do is wear the right type of socks that won’t cause excessive sweat, and use the SteriShoe UV shoe sanitizer to kill up to 99.9% of the living bacteria found in the shoes. You can also use a deodorizer powder or insole if you’d like for added freshness. Body odor can be a persistent and annoying problem for many individuals. If you’re concerned about the way you smell and how it’s affecting your interactions with people, it may be helpful to visit your doctor to discuss possible lifestyle and diet changes which may alleviate some of the issues. By knowing what steps to take and what to avoid, things may not necessarily come out smelling like roses, but there might be some definite improvement.